According to a criminal investigation expert, the photograph first showed that cracks were formed on the wall after the flood water receded. According to the explanation of the reporter, the local mud was quite sticky and dense. 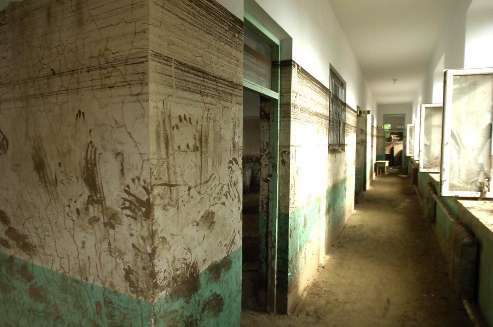 If the hand prints were smeared on the wall before the flood water receded, then they should be showing cracks afterwards since they were placed on top of the where the cracks would appear. Does this not say that the hand prints were added after the flood water receded and the walls were dried? 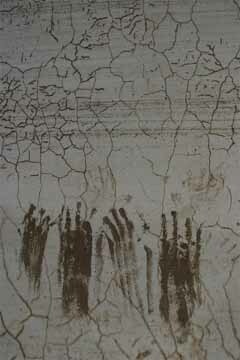 The students were swept away by the water outside, so the hand prints should exhibit some horizontal movement. Yet all four hand prints were vertically directed. This hand print was especially clear, but those around it were quite fuzzy. The water was rushing against the wall, so the print should not be so distinct. This was a classroom and there weren't any water-resistant black paint lying around. Even if there is, why would the student be reaching for it under the circumstances? Some of the hand prints were very distinct with clear edges. The palms must have been open and placed flat against the wall. Why would elementary school children who were trying to steady their bodies by grabbing the wall be doing that? A Huashangbao reporter said: "I compared the photographs that our reporters took at the scene with this published photo. In the published photo, the hand prints were obviously darkened by Photoshop." It is not a crucial mistake to adjust the contrast or color in the photo. The key was that the obvious flaw in the photograph was that the hand print was made after the muddy water receded. This is because there were some muddy spots at the top, but the ending points had the lifting away as seen in brush calligraphy. In truth, this is not a question of whether a news photograph ought to be edited by Photoshop. If this photograph is really the final sign from a dying child, then it is truly stunning. If it is not, then the value has to go down by at least 90%. 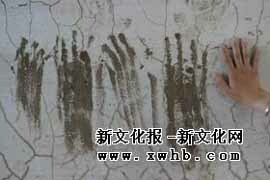 A Xinwenhuabao reporter wrote: "The sizes of the hand prints are larger than those of children. I placed my own hand next to them." 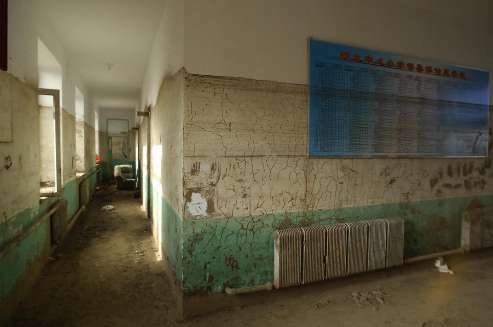 The reporter continued: "There were many clear hand prints on the walls of the classrooms and corridors, but they are large in size. A parent told me that after the flood water receded, many parents came looking for their children. At the time, the classrooms were littered with the bodies of the children. The parents were sifting through the deep mud to look for their own children. When they find them, they would carry them away. The searchers would wipe their hands on the walls before they left. When asked if the hand prints on the wall could come from the children, the parents said: 'How can you leave a muddy hand print under the water?'" Is this a done deal then? Not so fast. 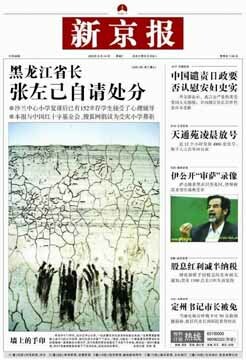 Shanghai Morning News (via Sina.com) A Surviving Student Returns To The Scene To Recall The Story Behind The Handprints. By Guo Xianghe. June 15, 2005. [in translation] Yesterday at about 15:00, 13-year-old fourth year student Zhao Mingxing met our special correspondent as he was leaving his afternoon class at Shalan Town Central Primary School. He spoke of the the flashflood on June 10. He said, "I feel terrible the last few days. Whenever I close my eyes, I can see the faces of the dead classmates ..."
Inside the fourth-year classroom, Zhao pointed to the window and said, "I stood on the ledge and I was able to avoid the flood. But many other classmates were struggling in the water. Then they vanished ..." At the time, only a few students were on the ledge and only a few managed to get close. A couple of other students survived by getting on the window ledge in the corridor. Zhao said that the stood there for more than an hour before the water slowly receded. Afterwards, it was found that 24 died out of a class of 34. As the water receded, some of the bodies of the classmates appeared. Zhao recalled that some were lying face up and some where face down. Zhao, who did not know much, pushed them and asked: "Are you okay?" But those students who had just spoken to him earlier are now breathless. One student by a table had his mouth wide open out of fear, and it looked terrifying. For the next few days, these scenes replayed themselves in Zhao's mind. So he was very distracted in class. This was the first time that he had been so close to a death scene. Zhao's best friend in class was named Wang Zhongqi. At 12 years old, Wang was a head shorter than Zhao, but they liked each other and hang around all the time. When the flood water rose, the children stood on their desks. When Zhao saw the water rising rapidly, he jumped over to the window ledge. By that time, the water had toppled over Wang's desk. As Zhao saw his best friend struggle in the water, he wanted to pull him up but he was too far away. As he hesitated, Wang vanished underneath. At that time, the windows broke and the water began to flow outside. After the water receded, they counted the bodies and Wang's body had been washed outside the classroom. "Will you remember this good primary school classmate when you grow up?" Zhao began to sob: "I am thinking. If there ever was another flood, I would act like a man and jumped into the water to save him at the risk of my own life." The water came quickly. Within a matter of a few dozen seconds, the desks underneath the children were all toppled over. Children who could not swim fell into the water. The water was muddy and carried a lot of sand, all the fallen children were covered with mud. 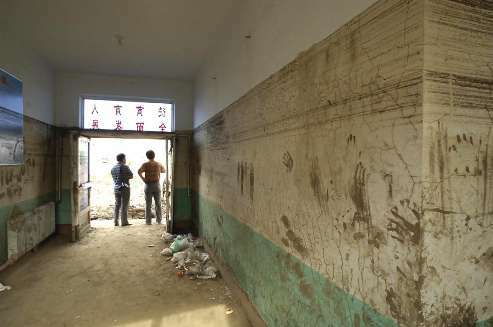 Zhao pointed to a handprint on the wall: "I saw 12-year-old Liu Hongda fall into the water. When he rose out of the water, he was covered with mud. He wanted to get up by hanging onto the wall. So he kept pulling at the wall and left two handprints on the wall. Then the water rose over his head, but he kept trying to crawl up the wall with his hands. But he could not get up. Then he disappeared. 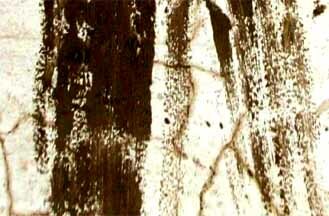 They have not found his body yet ..."
Why were the handprints on the walls clearly visible after the flashflood? According to the explanation from a People's Liberation Army soldier who participated in the rescue work, the mud at the bottom of the water was very sticky and also denser than the muddy flood water in the upper layers. As the children fell from their desks into the water, the water had already risen to a certain height and then slowly upwards inside the closed room. So there was no eroding action to sweep away the marks. As the water receded slowly, many such handprints were left behind on the walls. You can make up your own mind about the authenticity of those photographs. To my mind, the most impressive thing was the manner in which the debate was conducted. There exists a core group of media workers who care passionately about their professional work and who are capable of conducting discourse in a rational and dispassionate manner. The rapid response and full disclosure even compare favorably against how the major western media handle problems. Media in China is more than just a bunch of hacks re-printing Xinhua press releases.